Ok. The regulars around here know that I don't read much Christian fiction. I usually find it to be poorly written, generally presenting a forced message of the Gospel inside of a story format. The books generally feel stilted to me, lacking imagination. My general rule of thumb towards this genre is to avoid it, with the exception of a few authors, one of whom is Melanie Dobson. A couple of years ago I read my first Melanie Dobson book and loved it! She persuaded me through her story that Christians could write believable, FUN, and interesting stories in this modern age. Every time I go into a Christian book store, I look for her books. (Strangely, I have never managed to find one. I find this baffling and annoying at the same time. At the same time, I don't make a very frequent habit of going into Christian bookstores.) I've kept telling myself that the next time I run across one of her books, I'll pick it up and read it. About a month ago I received an e-mail from Howard Books Publishing letting me know that Dobson was coming out with a new book and asking if I would like to read it. WOULD I!? You betcha! Once again, I was not disappointed. Chateau of Secrets was fun, fun, fun! 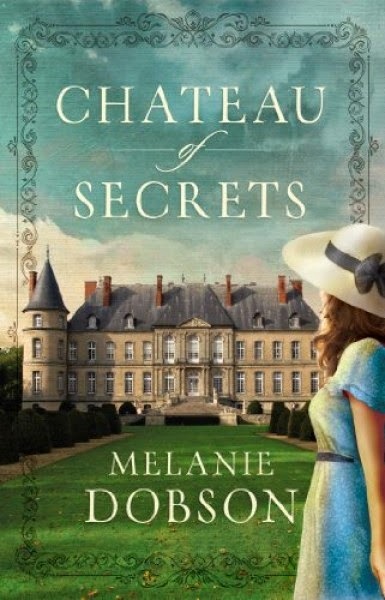 Chateau of Secrets is loosely based on the life of Genevieve Marie Josephe de Saint Pern Menke, a French woman who helped rescue Allied airmen and served France during World War II. Dobson's main character is named Gisèle Duchant. Gisèle, like Genevieve, was raised in a medieval chateau outside Saint-Lô in France. Gisèle is in her early twenties and her life is very happy until the Germans invade France. Not only do they invade her home country, but they also take possession of the Chateau where her family has lived, commandeering it for their local headquarters. Gisèle is forced to serve the Germans during the occupancy but her inner fight never dies and she works secretly to save both Jewish orphans and Allied airmen. Chateau of Secrets takes us back and forth between Gisèle in the 1940's to the present day. The chapters alternative between unfolding the story of what happened to Gisèle, her family, and the chateau. The reader also becomes acquainted with the the life story of her granddaughter, Chloe. Chloe exists in the modern day and is engaged to be married an up and coming politician. All is not what it should be in the couple's engagement and so Chloe takes a short trip to France to discover more about her family's history and to try to solve a great mystery in Gisèle's past. Their two stories are interwoven in what is probably a rather predictable way. Whether or not that is so, I don't care. I didn't allow myself to guess ahead but stayed in the moment of whatever chapter I was in, enjoying the ride. The ride Melanie Dobson took me was oh so entertaining and also provided some small insights into what the war would have looked like to occupied France. I thoroughly enjoyed this story and can only highly recommend it. I'm delighted to say that Howard Books has offered to give away a copy of this title to one of my readers here at Reading to Know. Would you care to win? Simply leave a comment below. PLEASE INCLUDE A VALID E-MAIL ADDRESS WITH YOUR COMMENT! This contest is open to U.S. Residents only and will remain open through Friday, May 16th. THIS CONTEST IS NOW CLOSED. THE WINNER, as selected by Random.org, IS #27 - Sky! Congrats! Many thanks to Howard Books Publishing who sent a copy of this title my direction in order to facilitate this review. I received no additional compensation for this post and all opinions are my own (as is always the case). I have never read Melanie. You know I like a handful of Christian fiction authors (Higgs, Gohlke, White...)A WHOLE LOT, so I' am eager to try one you recommend. Or should I say THE ONE? Wow! I'm pretty shocked and excited! I quickly made my way to my library's e-book page, but no luck on Dobson. She's on my list now, though!! Sounds great! I want to read it!! What a fun book! Sounds great! This book has been on my "want to read" list since I first started reading about it on various blogs. There are quite a few good Christian fiction writers, though I imagine, like in all genres, there are some that aren't so good. It's nice to know Melanie Dobson is an author whose books you enjoy reading. Thanks for the chance to win Chateau of Secrets. My go-to Christian author is Jamie Langston Turner. She's about the only one I read anymore, and I haven't picked up one of hers in a couple of years! This one sounds promising. Count me in! I'd like to give this a try! Sounds fascinating - historical fiction seems more believable to me? I share your opinions of Christian fiction (in general), but I do like WWII stories. This sounds like a good book for summer reading! Added this book to my to read list so I check it out even if I don't win. Well, I'm curious! You are pretty good at arousing curiosity! I'm going to try this one whether I read it or not! I just finished this book, and had to search back here to see what you'd said about it. Thanks for the recommendation! I enjoyed it quite a lot.